Old Saybrook Town Hall is located at 302 Main Street, Old Saybrook CT 06475; phone: 860-395-3123. Photo: Bushnell-Dickinson House, ca. 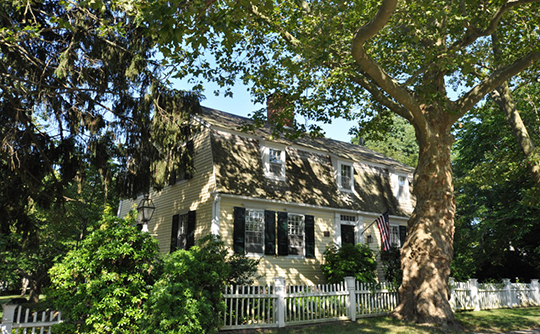 1790, 170 Old Post Road, Old Saybrook, CT. Listed on the National Register of Historic Places in 2013. Photographed by User:Magicpiano (own work), 2016, [cc-by-3.0 (creativecommons.org/licenses/by/3.0)], via Wikimedia Commons, accessed May, 2017. In the Spring of 1614, Adrien Block ascended the Connecticut river to the rapids at the head of navigation. He named the beautiful stream the "Versch," or Fresh Water River, from a strong downward current that was perceived a short distance above its mouth. By the native savages it was called the "Connittecock" or "Quonehtacut," and the aboriginal appellation survives to the present day, in the name of the river and the state. Block was thus the first European navigator of the river, and probably the first to set foot on the site of what is now the Town of Old Saybrook. Not long after this, Dutch traders began to visit the country every year, and soon established a large trade with the natives; buying annually, it was said, not less than 10,000 beaver skins, beside such other commodities as the country could furnish. Amsterdam ships continued their voyages to the New Netherlands, and the trade in peltry was industriously prosecuted, not only on the North and South Rivers, but on the "Fresh," or Connecticut River. In 1623, "two families and six men" were sent to the mouth of the "Fresh," by the Dutch at Manhattan Island, to commence the actual occupation of that part of the Dutch province. It is probable they did not remain long. Probably no more Dutch settlements were made at Saybrook until 1633. In the summer of that year the Dutch traders on the Connecticut were directed to arrange with the native Indians for the purchase of "most all the lands on both sides of the river." This was accomplished and Hans den Sluys, an officer of the company, also purchased at the same time the "Kievets Hook," afterward called Saybrook Point, at the mouth of the Connecticut, where the arms of the State's General were "affixed to a tree in token of possession." In October 1635, Governor Winthrop arrived in Boston with men, ammunition, ordinance and £2,000 in money, for the purpose of erecting fortifications at the mouth of the Connecticut River. Very soon after this arrival, he learned that the Dutch were preparing to take possession of the mouth of the river, so on the 9th of November, he dispatched a small vessel of 30 tons, with about 20 men, carpenters and others, under the command of Lieutenant Gibbons and Sergeant Willard, to take possession of the mouth of the river, and erect some buildings. This was the first regular English occupation of the territory comprehended within Lord Warwick's grant. The officers of the Dutch West India Company, who had bought this land from the Indians three years before, had affixed to a tree the arms of the State's General, in token of possession of Kievets Hook, and the river above, but the Englishmen contemptuously tore down this shield, and carved a grinning face in its stead. Winthrop's party took possession of the mouth of the river on the 24th of November, and early in the following December, a sloop which the Dutch Governor, Wouter van Twiller, had sent from Manhattan to take possession of Kievets Hook, and erect fortifications to secure it, arrived at the mouth of the river. The English however had been there long enough to get two pieces of cannon onto the shore, and they would not permit the Dutch to land. Governor Winthrop arrived soon after, bringing with him Lion Gardner, who had been an engineer and master workman in the service of the Prince of Orange, and who had married a Dutch wife, and who was expected to build a fort and lay out a city. Gardiner brought with him 12 men and two women. The Dutch having been repulsed, the English changed the name of Kievet's Hook to Saybrook, out of compliment to the leading English proprietors of Connecticut — Lord Say and Lord Brook. The original Indian name of Kievets Hook and the land near it was Pattaquassett. The most distinguished personage connected with the early history of Saybrook is John Winthrop, the younger. Having accepted the commission to build the fort and begin a plantation at Saybrook, he came with his wife to this country in October 1635. The commission was for one year and there is no account of its renewal. Historic of Middlesex County, Connecticut, J. B. Beers & Co., 36 Vesey Street, New York, 1884.